The Superbus, a Dutch invention with a top speed of 155 miles per hour, is a 50-foot long hybrid between a bus and a train. It's also electric, which is an added bonus. I'd say the Superbus is probably ahead of its time, but it's still wicked. 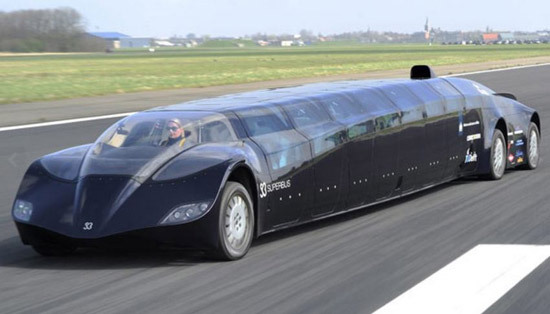 Although it gets best results on a dedicated lane of its own, the Superbus could run on any highway, and might offer a much cheaper alternative to inter-city high-speed rail transit. looks like a stretched Lamborghini to me...How many persons can it carry, at once? In what way is this anything like a train? As a gimmick, it's brilliant, but as practical transit? April Fool. Seats 23, by the way.